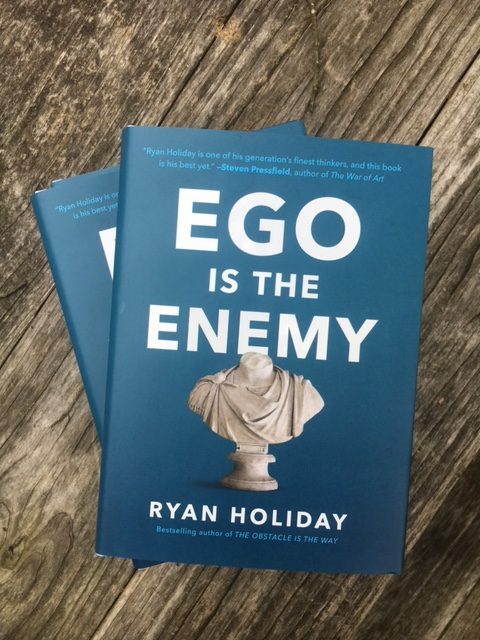 That’s a key question that author and strategist Ryan Holiday explores in his new book, “Ego Is The Enemy.” He shows how ego – irrational or delusional self-belief – has long been linked with success and striving for goals yet this same drive has a dark side. It’s an interesting challenge to navigate in the age of personal branding and social media. I love the expression Holiday references for managing one’s ego: it is like sweeping the floor. It’s an activity that needs to be done over and over again to maintain order. One of the book’s chapters is “Work Work Work.” It’s a great admonishment to continue honing our craft and working even after we achieve success. The book’s style – sharing examples from history and then analyzing them – reminds me of Robert Greene’s books “48 Laws of Power” and “Mastery.” Given Holiday once worked for Greene, that makes sense. As a student of history, it is an excellent approach to counter our culture’s tendency to live in the present. In the rest of this review, I will explore a few chapters and show they apply to career growth. Would you consider serving as an assistant, intern or aide to a successful person? Our popular culture is conflicted on this point. On the one hand, we have “The Devil Wears Prada” which suggests the opportunity aspect of working as an assistant. In contrast, we have the novel “The Assistants” by Camille Perri which emphasizes the stress and disappointment associated with this role. There is little glory in serving as an assistant. Yet, that lack of glory and attention presents an opportunity. Drawing on Benjamin Franklin’s early career and Roman history, Holiday shows how these relationships have provided benefits for the supposed underling for many years. As an apprentice, intern or simply a new person to the organization, serving and clearing the way for those in charge yields benefits. First, this strategy encourages you to slow down and observe how the organization works and what it values (e.g. risk management may be prized over innovation). Second, there is reduced personal risk in a support role so you have the opportunity to make mistakes as you learn. Finally, the canvas strategy helps to proactively avoid charges of egotism. Career Application: If you are new graduate or new hire, this strategy will equip you to focus on opportunity and learning rather than complaining about limitations. If you are established in your career, look for ways to serve those in higher levels. For years, I have pursued continuing education for professional and personal growth. Holiday shows that a student mindset goes a long way toward managing ego and avoiding disaster. Taking a page from history, he argues that the attitude to learn and adapt is a key reason for the success of the Mongol empire. Holiday’s perspective is especially important if you are thinking about career change, starting your career or simply looking to avoid the pain of ego. Continuing to focus on learning is easy when you acknowledge the world’s complexity. Career Application: There are many ways to stay a student. Observe your reactions to performance extremes (i.e. “What did that person do to become this company’s youngest executive?” or “What led to that division bearing the brunt of layoffs last year?”). Analyze somebody who has achieved success in your field using a different approach (e.g. if you became a successful project manager by mastering the details, observe how another project manager achieved success by focusing on leadership skills). Finally, take up the challenge to read in a different field – use Alltop to explore topics quickly. How far does genius, skill and inspiration take you? And what is the role of discipline and organization for high performance people? Holiday contrasts U.S. President Eisenhower’s focus on prioritization and delegation (see: the Eisenhower box) with the apparently unfocused approach of DeLorean. As a fan of the Back To The Future movies, I had only heard of DeLorean cars in those movies (see: DeLorean time machine) – I had no idea about the company’s troubled history and leadership. In Holiday’s analysis, DeLorean comes up as a brilliant player in the automotive industry who is frustrated by the restrictions at General Motors He leaves to start his own company where he can pursue his own vision. So far, this story fits perfectly into our culture’s fascination with maverick entrepreneurs. Unfortunately, DeLorean’s poor management translated into major operational problems: “Cost per unit was massively over budget. They hadn’t secured enough dealers. They couldn’t deliver cars to the ones they had. The launch was a disaster. DeLorean Motor Company never recovered.” Genius alone was not enough. A genius inventor or designer needs leadership skills to lead a company. Career Application: As you climb the ladder of success, develop new skills. As Holiday writes, “As you become more successful in your own field, your responsibilities may begin to change. Days become less and less about doing and more and more about making decisions… It requires a certain humility to put aside some of the more enjoyable or satisfying aspects parts of your previous job.” Shifting from an individual contributor (e.g. a software developer) to a management role (e.g. a project manager) is one of the most challenging shifts in our careers. That promotion is like entering high school or college – you’re starting at the bottom of a new ladder. Resource: The Effective Executive by Peter Drucker. A classic business text that can be read over and over again with good results. Resource: Leading Yourself With Getting Things Done. How you measure your success matters. If you exclusively use external measures (e.g. dollars earned, pageviews and awards), you are unlikely to be happy. Why? An exclusive scorecard ultimately depends on other people and factors that you cannot control. Instead, Holiday encourages readers to build our own scorecard. Warren Buffet, the billionaire investor, is noted for his commitment to this approach: How Warren Buffett defines success. Of course, there ought to be some link between between inner measures and outer results. If your scorecard simply tracks minutes per day spent watching paint dry, boosting that score is unlikely to lead to interesting results. Career Application: Take note of Holiday’s observation – “A person who judges himself based on his own standards doesn’t crave the spotlight the same way as someone who lets applause dictate success.” In the context of traditional employment, that means setting your own goals and standards apart from what an employer asks. How do you manage ego? What approaches have proven most helpful? Fabulous review. I firmly believe every professional must maintain a career as an aspiring student to learn. I have mentioned to numerous people that life is a ladder and there is no top rung for each of us. In climbing this ladder, we must embrace professional change and growth as ego is a part of this growth. To remain cognizant of ones ego is imperative and often to late when failing to view self from another’s perspective. Well said John. Glad to see that you are spreading the message. Bruce, thank you for a great review! I’m certain my praise will not inflate your ego. As a not-so-young-anymore person I have to agree with many that we live in the Culture of Death and Ego (CDE), with both of these things boosting our destructive delusions “to infinity and beyond’. In the past I worked with jail inmates and I noticed that, even though most of them where paragons of CDE, they were more able to manipulate those with big egos like themselves and totally unable to do that with those that had tiny egos or that were totally transcendent. Egos must die so real self-respect is born again. Egotism is not only highly toxic to ourselves but to the world as well as big egos will always fail in protecting the environment, helping the poor, or enacting positive social change, etc. and only just help create more of those very problems Toxic egotists will never save a toxic world but the real, the humble and the transcendent can.